The international Meatout Day is a day that is celebrated in the whole world by consumers, nature protectors, ecologists and protectors of animals and animal rights for the purpose of promoting the meatless diet. The aim is to help the consumers embrace the healthy, non-violent diet based on the fruit, vegetables, leguminous plants and cereals on the first day of spring that symbolises the rebirth and revival of the nature. On this day, we ask the consumers to think about their diet, to ask themselves if they want to continue participating in the shameless slaughtering of innocent animals and consumption of their corpses, or they want to embrace a non-violent, healthy, ecological and ethical diet - the vegetarianism. The action will take place in all cities in which there is a branch office of our organization, and the purpose of this action is to inform the public through banners, leaflets, vegetarian food samples, etc. in Rijeka, at the promenade, near Radio Rijeka, at 3 P.M.
in Sisak, near the clock, at 1:30 P.M. Since March 22 is the World Water Day, within this action we will also comment on damages that the meat industry causes with respect to the water problem of our planet. There are many reasons to become a vegetarian, and on this day many organisations all over the world ask the consumers to think about their future. 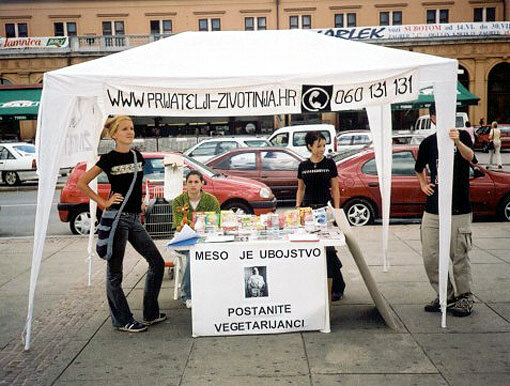 Animal Friends asks the Croatian consumers to think about vegetarianism. If you stop eating meat, you will reduce the risk of getting a heart condition, the stroke, the cancer and other chronic diseases that disable and kill over 3 million people each year, which is documented and confirmed by hundreds of studies. In that way, you will also increase your energy, make the preparation of meals easier and reduce your food costs, not to mention having a clear conscience. By giving up meat, you will help to protect the earth, water and other sources of food production that are necessary for the survival of your children and your children's children. By giving up meat, you will make it possible for the hungry people of the world to be saved and provided with the wheat and other grains that are used to feed the animals at the moment. 60 kg of the wheat are needed for the production of 1 kg of the meat, and the quantity of meat that feeds only two persons can be obtained at the surface as big as 5 football fields, i.e. 25 acres, or, alternatively, a quantity of corn that feeds 10 persons, a quantity of grain that feeds 24 persons, or a quantity of soy that feeds 61 person. By eating meat, one indirectly supports the hunger in the world and an unequal food distribution. The fuel spent for a 4-member family consuming the meat is sufficient for a person to drive the automobile for 6 months. On the same piece of land necessary for the production of 1 kg of meat one can, for example, produce 200 kg of potato or 160 kg of tomatoes, and in the same period of time, too. Similarly, instead of 50 kg of the beef, one can obtain 1,000 kg of cherries, 6,000 kg of carrot, or 4,000 kg of apples. The same piece of land that can feed 1 meat-eater can be used to feed 20 vegetarians! The ammonia gas coming from stables, in which the cattle are kept, causes more damage than all the automobiles and factories in the world together. One needs 10,000 litres of the water to produce 1 kg of the meat, and only 100 litres for 1 kg of the wheat. The water quantity necessary for the production of 10 steaks is equal to the water quantity consumed by an average family in the whole year. Only in the USA, the meat industry pollutes the water as much as all industries and all cities together. About 50% of the water pollution in Europe is caused by massive livestock raising, and about 50% of the total world water consumption is used for the same purpose. Since 1970, more than 50 million acres of tropical forests have been turned into the grazing land. Millions and millions of acres of tropical forests are destroyed each year because of the grazing land. This kills and endangers many animal species, as well as the people who live there. Regarding the huge needs of the meat industry, there will be no tropical forests left in 40 years! 1/3 of the Earth surface is already used as the grazing land, and cattle farms cause 85% of the total nitrogen emission in form of ammonia gas that is considered to be the main cause of the forest extinction. By giving up meat, you will help to protect our forests, grazing land and other natural habitats, as well as to reduce the water pollution by particles of dust, fertilizers and pesticides. The major cause of the air and water pollution is the meat industry, which causes the global warming and the tropical forests to be cut much more than e.g. the car industry. By giving up meat, you will save the innocent, sensitive creatures from captivity, isolation, loss of their rights, poisoning, mutilation, abuse and slaughtering. The animals have the right to live, and billions of those creatures are experiencing the horrible suffering at the farms all over the world at this very moment. Isolated and captured, they are waiting for their turn to be slaughtered. And they are slaughtered because of the consumers buying meat and processed-meat products. Put an end to it, prevent the animal suffering and slaughtering - become vegetarians. IF YOU WANT TO HELP YORSELVES, THE HUNGRY PEOPLE, THE NATURE, THE ANIMALS AND THE WHOLE PLANET, STOP EATING MEAT.